Maple Razsa discusses Bastards of Utopia: Living Radical Politics after Socialism. He will be joined in conversation with Owen Kohl. A Q&A and signing will follow the discussion. About the Book: Bastards of Utopia: Living Radical Politics After Socialism, published by Indiana University Press in 2015, explores the experiences and political imagination of young radical activists in the former Yugoslavia, participants in what they call alterglobalization or "globalization from below." Ethnographer Maple Razsa follows individual activists from the transnational protests against globalization of the early 2000s through the Occupy encampments. His portrayal of activism is both empathetic and unflinching—an engaged, elegant meditation on the struggle to re-imagine leftist politics and the power of a country's youth. 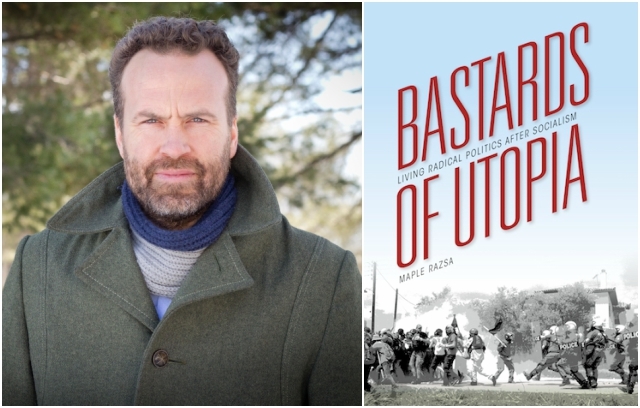 Bastards of Utopia is the written companion to Maple Razsa's film of the same title. It won the William A. Douglass Prize in Europeanist Anthropology. About the author: Maple Razsa is an Associate Professor and Director of Global Studies at Colby College. He is committed to using text, images, and sound to embody the lived experience, as well as the political imaginations of contemporary social movements. Trained as a filmmaker and anthropologist at Harvard University, Maple has conducted fieldwork with alterglobalization protesters, anarchist-punk squatters, migrant-labor organizers, video activists, and, most recently, opponents and transgressors of the European border regime. His films—including The Maribor Uprisings, Occupation: A Film About the Harvard Living Wage Sit-In, and Bastards of Utopia—have shown in festivals around the world. The Society for Visual Anthropology named Uprisings the Best Feature Film of 2017. Maple has held appointments at Stockholm and Harvard Universities, Amherst College, and fellowships from IREX, NSF, Wenner-Gren, ACLS, Fulbright and Truman Foundations. His current research project is Insurgent Mobilities (in collaboration with Nadia El-Shaarawi), an ethnography of refugee and activist struggles to enact freedom of movement in Europe. About the interlocutor: Owen Kohl recently defended his Ph.D. dissertation in Anthropology at the University of Chicago. About the series: In collaboration with the Seminary Co-op Bookstores, UChicago Urban has launched the Urban Readers Series, an author-centered series of readings and conversations at the Seminary Co-op. At Urban Readers, people from all over Chicago can hear from the university's scholars and connect with one another over urban issues, histories and futures. All books in the series are written by UChicago's faculty, alumni, and affiliates.